It is not surprising to see opeh leaf hor fun being disguised by pretentious facades at some cze char outlets but then the novelty of it is not just a matter of putting fried hor fun on a piece of opeh leaf. 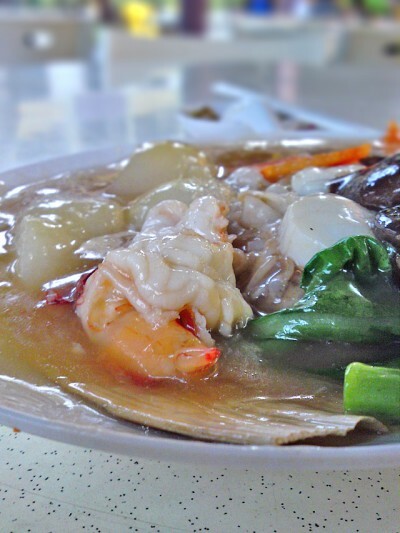 The niceties of an opeh leaf hor fun must include the inconspicuous wok hei with plenty of delicious seafood(king prawns and cucumber) while the gravy must do a good job in blending the flavour and the taste to exceedingly shiokness. Other novelties include the pricing of it which usually will cost you something in the region of $10. Why? Because of the trouble to wok your hor fun and the obvious pricier ingredients used. But these ‘guidelines’ are just the basis to an opeh leaf hor fun, whether it’s appetizingly shiok or not, still has to depend on the skill of the chef. 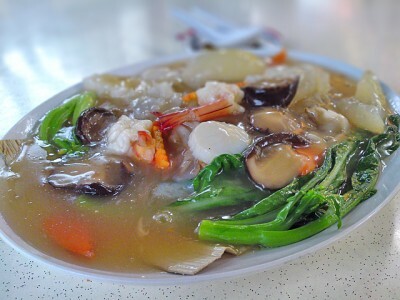 Top Seafood at Toa Payoh is a relatively new cze char stall and one of their signature dishes just happens to be an opeh leaf hor fun which is termed as Signature Hor Fun here. 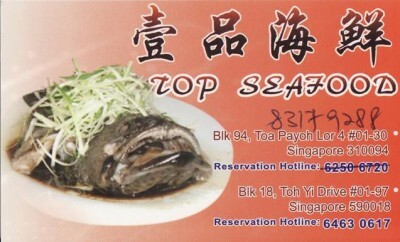 Top Seafood is misrepresented by some to be ‘Chi Hao Liao’ where in fact ‘Chi Hao Liao’ is the name of the coffeeshop and they are just occupying a small space of the shop to run a cze char business. This is one opeh leaf hor fun that I thought resembles Fei Lao’s version the most. The gravy is quite tasty with a subtle wine flavour. Definitely one of the best amongst all of those I’ve eaten lately. There were sea cucumbers and king prawns which are just what you can find in a pack at Fei Lao. Here it goes one step better by giving you a few pieces of scallop. For value of ingredients, I thought this is the best plate among all I’ve eaten. These are not cheapsake ingredients, and there were some more other miscellaneous things like big chinese mushrooms and several stalks of choi sum. I don’t remember getting a plate of opeh leaf hor fun lavish with such good ingredients other than at Fei Lao, so if you are an ‘ingredients person’ for a pack of hor fun, who happens to reside on the northern part of Singapore and feeling lazy to visit Fei Lao, then Top Seafood would be a brainy choice. So with ticks for gravy and ingredients, how did the wok hei fare? It was very good. I’m very tempted to rate the wok hei here better than Fei Lao but though it is as good, it loses a bit on the consistency. Certain part of the hor fun was not properly seared. But the part that was seared, is very very good. 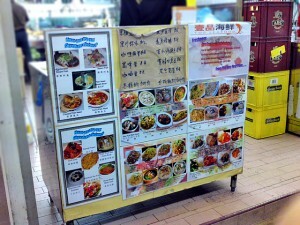 Unfortunately, some of the ingredients(prawns/sea cucumbers) were not warm(yes, cold). This just means that the ingredients were precooked or it didn’t get enough wok time. What seemingly to be the most similar to the Fei Lao’s plate just happens to have certain basic elements intervening at the rating chart but I like to believe that it’s just a hiccup and not a choke to such a fine plate of hor fun. However, even with that ’short fall’, this is still one of the finest plate around. Won’t insist this is a better plate than one at Fei Lao but it is almost as good in flavour and not many areas to tweak to taste as shiok. Conclusion: A very good plate of hor fun where the basics are right. Taste and flavour resemble Fei Lao’s the most amongst all I’ve eaten lately. Ingredients are generous. Not the slightest doubt that here is where I will get my substitute if Fei Lao just happens to be closed. Dislikes: Ingredients are cold(not enough time in the wok). I just tried it tonight. Expected a lot but a bit dissapointed. I asked to tar pau the horfun, and I expected it ot be totally wrapped up in Opeh leaf. The guy said the opeh leadf inside. So I brought it home and opened it, and found the open leaf was only on the base of the packet, just like in the pic. So small piece definitely will not impart any smell to the horfun. Ingredient were generous, but still lacking in the wok-hei I was looking for. My rating only 7 out of 10 stars. Yeap, this stall doesn’t wrap up the hor fun in it. I guess they have several cooks. My friend told me that they were much better in the past. Mine had quite good wok hei though.